U.S. stocks traded mixed on Wednesday as uncertainty over the economy and Federal Reserve’s direction weighed on valuations for the day. On Wednesday, the Dow Jones Industrial Average closed lower at 17,526.62 for a loss of -3.36 points or -0.02 percent. The S&P 500 Index was higher at 2,047.63 for a gain of 0.42 points or 0.02 percent. The Nasdaq Composite Index was also higher at 4,739.12 for a gain of 23.39 points or 0.50 percent. The VIX Volatility Index traded considerably higher for the day at 16.04 for a gain of 0.47 points or 3.02 percent. The Federal Reserve’s release of its April meeting minutes caused increased volatility in the market Wednesday as it showed some signs of caution both in the U.S. and globally. In the U.S. recent GDP and employment data has weakened and globally there are major challenges the Fed must consider including the U.K.’s potential exit from the European Union, the Eurozone’s deal talks over varying provisions for a Greek bailout and economic data in China which is still mildly a concern. With these global factors and the economy’s slowing indicators, the main focus for the Fed’s decision will likely be on the dollar affects. Under these circumstances a later in the year increase from the Fed is the most likely, however a June rate increase could be plausible if data in the next few weeks shows positive improvement. Retail stocks also continued to remain in the spotlight on Wednesday as department stores showed signs of weakening and consumers are spending less time in stores reducing traffic and in store sales. In recent trading, Home Depot, Target and Lowe’s have all been trading actively with recent earnings reports. On Wednesday, Home Depot closed at $131.75 for a loss of -0.21 points or -0.16 percent. Target was also lower closing at $67.99 for a loss of -5.60 points or -7.61 percent. Lowe’s, however reported a gain with a stock price close of $78.60, up 3.33 percent. In the Dow, Cisco also reported earnings after the bell and Wal-Mart will report earnings later this week. Top sectors gaining broadly for the day included financials and healthcare while utilities and materials were lower. The Nasdaq Composite closed higher at 4,739.12 for a gain of 23.39 points or 0.50 percent. The Nasdaq 100 was also higher at 4,338.23 for a gain of 15.68 points or 0.36 percent. In the technology sector top gainers for the day included Charter Communications, up 11.83 percent and Western Digital, up 4.65 percent. Technology stocks reporting losses included Discovery Communications down 3.54 percent and TripAdvisor down 2.46 percent. In commodities, gold traded lower as evidenced by the SPDR Gold Trust which reported a loss of -2.12 points or -1.73 percent. The dollar was higher for the day as the U.S. Dollar Index gained 0.63 points or 0.67 percent to 95.20. In small-caps, the Russell 2000 was higher for the day at 1,102.95 for a gain of 5.28 points or 0.48 percent. The S&P 600 closed at 676.19 for a gain of 3.53 points or 0.52 percent. The Dow Jones Small-Cap Growth TSM Index closed at 6,766.69 for a gain of 18.11 points or 0.27 percent. 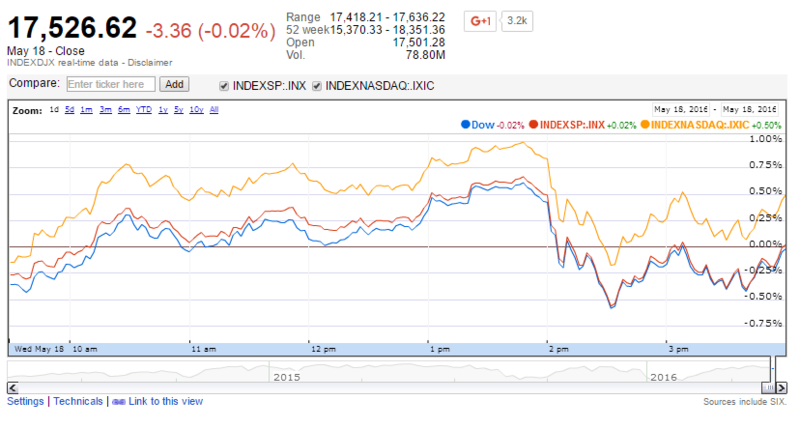 The Dow Jones Small-Cap Value TSM closed at 8,016.07 for a loss of -3.98 points or -0.05 percent. Other notable index closes included the S&P 400 Mid-Cap Index which closed at 1,436.15 for a loss of -2.66 points or -0.18 percent; the Russell 3000 which closed at 1,204.14 for a gain of 0.40 points or 0.03 percent; and the Dow Jones U.S. Select Dividend Index which closed at 576.73 for a loss of -4.43 points or -0.76 percent.